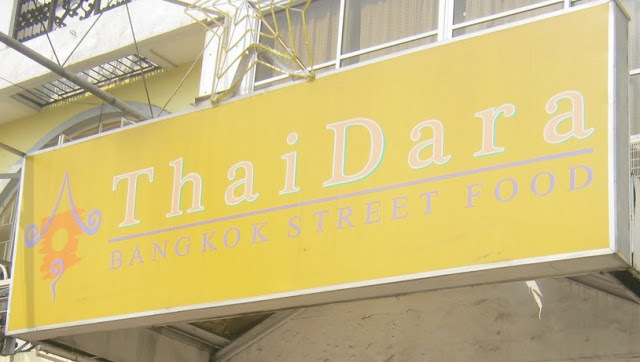 Thai Dara is a little restaurant along Granada St. which serves authentic Thai food. I've been here twice and I must say that it really feels like you are eating in Thailand. The place is not too grand and interiors were very minimal. The place could accommodate at least 25-30 diners only. I love the seat cushions and pillows that had Thai accents. There were also pictures of different diners posted on the wall. We even saw some famous celebrities too. Of course, we started with the classic and our usual order in Thai restaurants. I love their Pad Thai very much because it has this sweet and nutty taste. It was not too dry and the noodles were really chewy. Even though there was only one piece of shrimp, the dish was loaded with other toppings such as chicken, tofu, nuts and sprouts. No wonder Thai Dara's Pad Thai emerged as one of the Top 3 Best Pad Thai in Manila according to Spot.ph. Was wondering why the noodles were pinkish in color though. Next is also a classic favorite, their Bagoong Rice (P189). It was loaded with lots of toppings like onions, cucumber, green mangoes and eggs, and some small crispy shrimp. The sweet pork was also good and the pieces served were meaty unlike other restaurants that serves fatty pork. D did not quite liked the bagoong rice but it was okay for me. Maybe because it lacked the strong bagoong taste he was looking for. The rice seemed to be mushy too. Then, we had an additional order of their Crispy Tofu (P139) which D and I liked very much the first time we tried it. It was crispy tofu with cucumber and topped with caramelized onions on top. The sauce is the secret key to this dish. It was sweet and nutty which I love and the tofu was crispy on the outside but soft and firm on the inside. Price is reasonable cheap considering that it offers authentic Thai food.